Pe Ell's name has nothing to do with the railroad, making it somewhat unique in Lewis County. Photo courtesy: United States Forest Service. The towns of Lewis County have some interesting names. These are often overlooked, as they have become commonplace in our daily lexicon. In a previous post, we looked at how towns like Kosmos and Onalaska, Vader and Mossyrock, got their names, discovering a rich history in the process. In this installment we look at six more Lewis County towns, each with its own unique story. The naming of Toledo began in 1879 when Augustus Rochon plotted three blocks of the original town. While many lived on the prairies surrounding present-day Toledo, there was a need for infrastructure, which Rochon’s purchase provided. Almost immediately, plots of land were purchased and the town got a general store, yet it wasn’t until 1881 that the growing area had a name. Toledo wasn’t named for the best of reasons, but definitely not the worst. According to the City of Toledo’s website, the name was picked by Mrs. Celeste Rochon who, when tasked with picking a name, looked outside and saw the riverboat “Toledo” sitting in the water. The rest is history. Morton, famous for logging, was named after a man with amazing facial hair. He was also the Vice President. Photo courtesy: Tacoma Public Library. While the area now known as Morton has been home to people for countless generations, the town itself wasn’t incorporated until the start of 1914. Before that, settlers had been calling the region home since the late 1800s, with the first school opening in 1894. The burly lumber town was named in 1891 when the first post office arrived. The name “Morton” was picked by an old timer of the region, H.G. Temple, who named the town after Vice President Levi P. Morton. 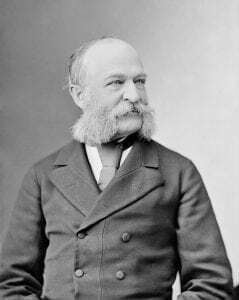 Vice President Morton had incredible facial hair which might have been why the lumber town picked him as their namesake. Located at the start of Central Lewis County’s Shoestring Valley and north of Mossyrock, the community of Cinebar is unique, its name highlighting the mining history of the area. While the exact year the name was picked for the unincorporated town is unknown, the region’s name makes perfect sense. Cinebar is named after the mineral Cinnabar, which is the most common source of mercury in nature. 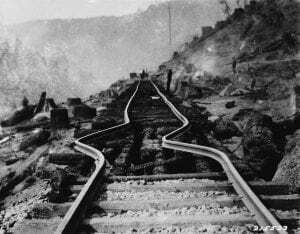 The cinnabar deposits that gave the region its name are found northeast of the community, where mining occurred for a number of years. 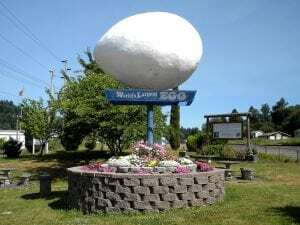 Winlock’s is home to the “World’s Largest Egg,” but it isn’t named Eggville. Photo credit: Ray Schauweker. While incorporated as a city in 1890, the name Winlock had been around since 1873. Long before the area become famous as a major egg producer, the tiny hamlet was a place of settlement during the 1850s. 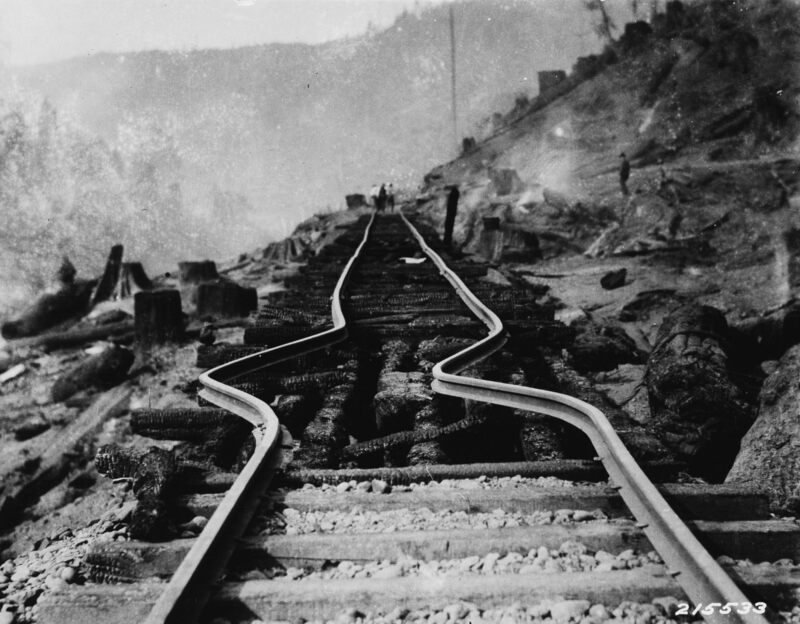 While a few thought the region should be named Olequa, after the valley and the creek found nearby, the Northern Pacific Railway had other ideas. Like many areas around the west, the name Winlock comes from the last name of a man who was a prominent local. Railroad officials named the town after Territorial Army General William Winlock Miller to honor him. As a gateway to White Pass, the town of Packwood is a great basecamp for outdoor adventures. While today the name is synonymous with nature, the town had one previous name that conjured a different mental image. Beginning in the 1890s, the town we now know as Packwood was known as Sulphur Springs. This name was selected by the post office. In 1910, the town’s name was switched to Lewis, but that was changed again a decade later due to mail being misdirected to nearby Fort Lewis. Since April 1, 1930, the town has been known as Packwood, named after William Packwood, one of the first non-natives to see the area. Pe Ell’s name has nothing to do with the railroad, making it somewhat unique in Lewis County. Photo courtesy: United States Forest Service. Located on the Chehalis River, the small town of Pe Ell has an interesting history unlike the county’s other towns. Before the town was a bustling, busy sawmill in the late 1800s, Pe Ell was a settlement town, like many of the communities around the region. The name Pe Ell comes from the first name of a Mr. Pierre Charles, who received a large chunk of land in the region during the 1850s. According to the Tacoma Public Library, the name Pe Ell comes from a mispronunciation of the name Pierre by the local tribe. After that name caught on, Pe Ell’s locals embraced the mispronunciation. Incorporated as a city on March 9, 1906, Pe Ell is unique and beloved by locals.